We’re still catching up with TCM’s marathon of spy films from Jan. 25. Anyway, in the Carol Reed-directed Our Man in Havana, there’s a sort-of in-joke to James Bond films. 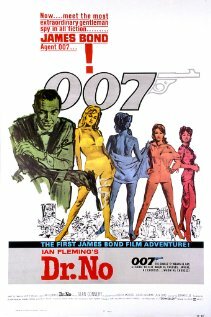 Considering the movie was released in late 1959, before the 007 film series debuted with Dr. No in 1962, that’s a mean trick. Here’s the explanation. Our Man in Havana’s crew included Syd Cain, who was the movie’s assistant art director. Cain, of course, worked on a number of Bond films, including as art director of Dr. No and From Russia With Love and production designer of On Her Majesty’s Secret Service. 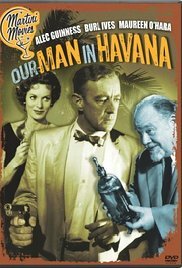 Our Man in Havana involves Jim Wormold (Alec Guiness), a seller of vacuum clearners who’s recruited to be the British Secret Service’s man in pre-revolution Havana. Wormold, after unsuccessfully trying to recruit a spy network, begins making stuff up — and London is buying (literally) every bit of it. Wormold is now considered so important that British Intelligence is assigning him support personnel, including a secretary (Maureen O’Hara). One of Wormold’s fictional agents supposedly flew over a secret Cuban installation and saw a secret weapon (really a drawing of a vacuum cleaner). Now, there’s pressure from London to get photographs of it. This particular strip depicts Rock crashing into the side of a mountain. “We shall hear no more of Captain Rock Kent!” reads the caption accompanying the drawing of the plane crashing. This gives Wormold an idea how to solve his problem. Of course, things get more complicated. Regardless, it’s an amusing moment for viewers familiar with the early 007 movies. 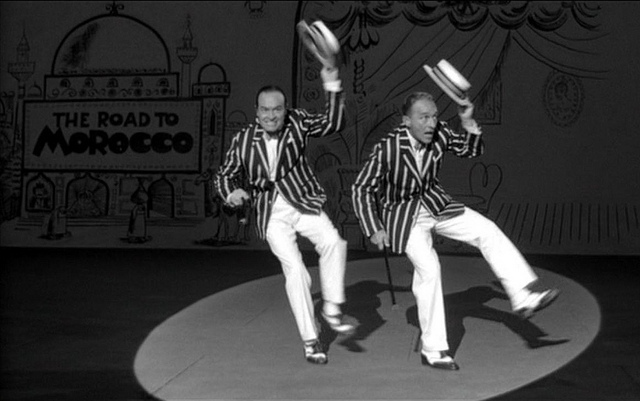 Five months before the debut of Dr. No, the final Bob Hope-Bing Crosby “Road” movie came out, The Road to Hong Kong. The film, we suspect by coincidence, provided a road map to the future of 007 movies. The 1962 movie had some major departures from previous “Road” movies. It was produced in the U.K. and was released by United Artists. The earlier films in the series had been produced in Hollywood and released by Paramount. Dorothy Lamour, the female lead of the previous Road movies, makes a cameo as herself but Joan Collins is the main female lead. The change in locale meant the Norman Panama-Melvin Frank production (both would write the script, Panama directed and Frank produced; the duo had written the 1946 Road to Utopia) would take advantage of U.K. movie talent: Syd Cain was one of the art directors. Maurice Binder designed the main titles. Walter Gotell is one of the main lieutenants of a mysterious organization — stop us if you’ve heard this before — trying to take over the world. Bob Simmons shows up late in the movie as an astronaut in the employ of the villainous organization. What’s more, there are “animated” sets (designed by Roger Furse) at the villain’s lair that would do Ken Adam proud. Two future participants in the 1967 Casino Royale (Peter Sellers and David Niven) show up in cameos. Did we mention Frank Sinatra and Dean Martin making cameos at the end? Well, they do. If you’ve never seen The Road to Hong Kong, you can CLICK HERE and watch the 91-minute film on YouTube (at least until it gets taken off that Web site). While a comedy, it is a preview of the more fantastic Bond movies that would emerge a few years later, starting with 1967’s You Only Live Twice. 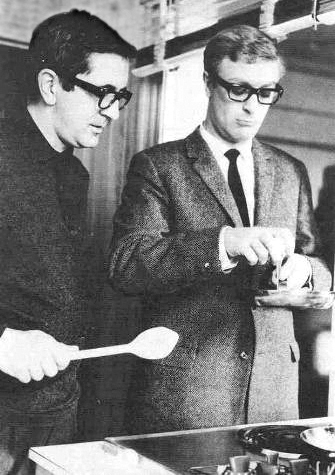 The Deighton Dossier blog has a new interview with author Len Deighton. You can read the entire interview by CLICKING HERE One thing that caught our eye was Deighton’s description of his work on From Russia With Love, the second 007 film. The Q and A featured questions from readers. One of those readers was Jeremy Duns, journalist (he dug out Ben Hecht’s screenplay drafts for producer Charles K. Feldman’s Casino Royale) and spy author. Richard Maibaum got the screenplay credit for From Russia With Love, with Johanna Harwood receiving an “adapted by” credit. Maibaum had a long association with Eon Productions co-founder Albert R. Broccoli. On the early Bond films, Harry Saltzman, the other Eon co-founder, was involved heavily in developing the scripts and often sought English writers such as Paul Dehn and John Hopkins. Saltzman later produced the Harry Palmer series, starring Michael Caine, based on Deighton novels. I’m very interested in your work on From Russia With Love – do you have any surviving drafts of your script and how do you regard it? Len: I went to Istanbul with Harry Saltzman, plus the director and the art director. As with virtually all movies, the producer is the driving force who gets the idea, buys the rights, commissions the screenplay, chooses the actors and employs the director. Harry demonstrated this creative power. We took breakfast together every day so that he could guide me and teach me how film stories worked. It was a wonderful course in movie making especially as the rest of each day was spent roaming around Istanbul with Harry plus the director and art director talking about locations and building the sets back in England. I’ve always been rather careless about typescripts and notes etc. And having a restless disposition I have packed, unpacked and repacked countless times as my family and I lived in different countries, I don’t have much written stuff left. Terence Young directed the movie and Syd Cain worked as art director, with Michael White as assistant art director. 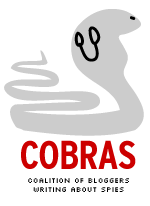 The Deighton Dossier and this blog, are members of the Coalition Of Bloggers wRiting About Spies. We noticed the From Russia With Love mention from Tweets by Jeremy Duns. The Oscars (R) telecast on ABC early in the proceedings had a montage of clips of popular movies of yesteryear. Austin Powers made the cut while 007 got blanked. Shortly thereafter, there was a montage of actors talking about the first movie they saw. Adam Sandler said his was Diamonds Are Forever when he was 5. He said something about being impressed by Sean Connery’s performance and his chest hair and that inspired him to become an actor. For some critics, that will be seen as another reason why Bond films aren’t good. UPDATE: Bond film alumnus John Richardson lost out on a visual effects Oscar. He and three others were nominated for Harry Potter And the Deathly Hallows Part 2. The special effects team for Hugo won the award. UPDATE II: Skyfall screenwriter John Logan, nominated for Hugo, loses out on the adapted screenplay award. The writers for The Descendants win. UPDATE III: The In Memoriam segment had only one person with any major 007 connection, former studio executive John Calley, who was involved in relaunching the Bond series with 1995’s GoldenEye. Barbara Broccoli, co-boss of Eon Productions, reportedly had issues with Calley. Like him or not, he was a major player at a time some questioned whether the series could be revived after a long hiatus. Syd Cain, who passed away last year and helped sets on a number of 007 films, wasn’t included. In 2011, major actors such as Elizabeth Taylor and Peter Falk passed away as did Gilbert Cates, a director who also produced a number of Oscar telecasts and who first hired Billy Crystal as host of the Oscars telecast. Movie director Ken Russell died this week at the age of 84. Obituaries concentrated on films such as the rock opera Tommy or the drama Women In Love. Russell though had a flirtation with spy entertainment, directing 1967’s Billion Dollar Brain, the third of 007 producer Harry Saltzman’s Harry Palmer series, based on Len Deighton’s novels, and starring Michael Caine. It wasn’t supposed to be Saltzman’s last film of the series but it turned out that way. Saltzman, restless by nature, wasn’t content with producing James Bond films with Albert R. Broccoli. Various authors have detailed how Saltzman’s outside ventures caused tensions between Saltzman and Broccoli. Nevertheless, Saltzman frequently tapped the talents of 007 crew members. Billion Dollar Brain was no exception, including sets designed by Syd Cain and titles designed by Maurice Binder. When the subject of James Bond movies comes up, Syd Cain isn’t one of the first names to come up. But Cain, who has passed away at the age of 93, is one of the unsung heroes of the long-running film series. 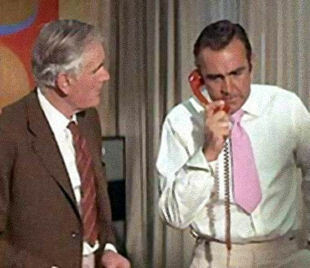 In Dr. No, the first 007 film, Cain had the title of art director and was essentially the deputy to production designer Ken Adam while not receiving a credit. In the John Cork-directed documentary Inside Dr. No, Cain described how he had to wade into a swamp in Jamaica and had to deal with leeches. Hardly glamorous. Cain returned to the series with 1969’s On Her Majesty’s Secret Service, this time with the fancier title of production designer, the same title Adam had. That movie couldn’t boast of a volcano headquarters set a la Adam’s You Only Twice set of SPECTRE headquarters. But Cain’s sets for SPECTRE’s home base in Majesty’s were impressive in their own right (integrating actual locations and buildings in Switzerland). Finally, he was the lead production designer of Roger Moore’s 007 debut, Live And Let Die (this time with the less-fancy title of supervising art director). Ken Adam, rightfully, is hailed as the innovator of 007 art design with his seven Bond films which included the volcano set, Goldfinger’s Fort Knox sets, The Spy Who Loved Me’s Stromberg villain’s lair and others. Peter Lamont get kudos for longevity, designing sets for nine Bond movies (after also being one of Adam’s deputies), starting with 1981’s For Your Your Eyes Only and running through 2006’s Casino Royale. Also, both Adam and Lamont won Oscars for their non-007 work. Cain didn’t get that kind of acclaim. But he was responsible for the look of two of the best Bond movies (From Russia With Love and On Her Majesty’s Secret Service) regardless of his on-screen credit. And he helped Adam in a major way on the first Bond film. On top of all that, his spy entertainment work includes The New Avengers, the 1970s continuation of The Avengers television series. So, RIP, Mr. Cain. Heroes may go unsung, but they are heroes all the same.